Your first port of call for protein should be from real food sources and not supplements, writes David Last. OVER THE LAST few weeks, the topic of supplements, and in particular whey protein, has been discussed. From working in the industry for the last 10 years, I can safely say that yes, some supplements do have a place for certain individuals but they should only be looked at once you have the basics covered when it comes to your nutrition and other lifestyle factors. For a lot of us, supplements can be quite overwhelming and perhaps it’s an avenue we really have little or no knowledge on and I generally find that most people follow the trend when it comes to going with certain supplements. Let me start by re-emphasising that I am not a nutritionist, dietitian or affiliated with any supplement store or brand. Instead, I will try and cover the basic information in an honest way and give you the advice I offer to my clients. Protein is a macro-nutrient that is essential to building muscle mass. Every individual needs muscle mass in their body for sustaining a healthy lifestyle. The term muscle can sometimes scare people away from protein but the truth is that you need muscle just like you need a certain amount of body fat in your body to for fighting off colds, flu and viruses. Protein is commonly found in animal products, though is also present in other sources, such as nuts and legumes. This really varies for each individual. It really all depends on gender, age, goal and activity level. A low-level of daily protein intake ranges from 0.8 grams of protein per kilo of body weight right up to 2.5 grams of protein per kilogram for very active athletes. Over the years of working with all kinds of individuals I would regard the average person needs most to be eating about 1 to 1.2 grams of protein per kilo of body weight. However, if you are an active individual looking to improve performance, aid recovery and increase your strength then you need to be getting a lot higher than 0.8 grams. An active 80kg male that trains 3-4 times per week and is looking to recover a little bit better in between workouts and overall looking to stay on top of his sessions needs to be getting in at least 150g-200g of protein per day. If he finds during the day he can’t find enough time to be squeezing 20-40g of real food per meal/snack he then could look at incorporating a protein shake or two into his daily regime. A protein shake with 1-2 scoops can generally cover 30-40g. An 80kg male that doesn’t really train too often, jumps on the bike to work and plays tag rugby once a week might not need as much protein as the example above. In my opinion, he still needs a good daily allowance and would ideally be aiming to hit at least 80-120g of protein per day. The first port of call should be to try get your daily protein from real food sources but the shake here can be a good convenience into your day. When do you eat protein? A good rule of thumb is to have 20-40 grams of protein within each balanced meal spaced out through the day. Ideally you should be aiming for at least three or four meals a day. This could be something as simple as eggs in the morning, a tuna or chicken salad at lunch or even a turkey breast or two for dinner. Of course the best option first is to be eating real food and getting sufficient amounts of protein from food first but a lot of the time we don’t have the time to be cooking up food three times a day and we need to find far more easy and convenient ways of keeping our protein levels topped up. An easy approach here is looking at a basic protein supplement. Personally, whey protein is what works best for me and would be the most popular option. The reason I use whey is because it’s far more convenient and easy for me at certain times during the day. First thing in the morning I would pop a scoop of whey into my morning smoothie or morning oats to set me up for the day. Not only is this saving me some time but overall it’s quite easy to stomach first thing. Along with that, after a tough training session I find it handy to have a protein shake in my bag. The brands I have used over the years and have worked well for myself and my clients are Kinetica and Optimum Nutrition. Above is a basic example of a morning smoothie with whey protein. It’s a well-balanced shake with fruit, veg (carbs), nut butter (healthy fat) and vanilla flavour whey protein. 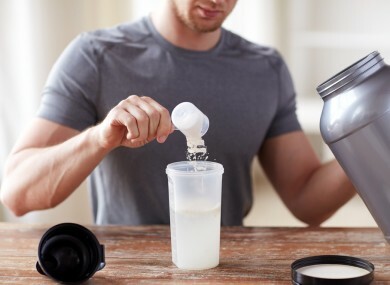 If you struggle to find time or you find you just can’t get certain solids into you at certain times of the day, then looking at a simple protein shake is something that really can help you out. Over the years I have seen positive outcomes like improved muscle tone, decreased sugar binge and better performance when it comes to their training when clients introduce shakes into their diet. Email “What is whey protein and do we need it in our diets? ”. Feedback on “What is whey protein and do we need it in our diets? ”.